After discovering his love of film and art at an early age Andy has immersed himself in all aspects of editing and storytelling. Living around the corner from Pinewood Studios in the UK it was always a dream of Andy’s to edit. Starting very humbly in a video duplication house, Andy always stayed behind after work to use the linear suites. After eight years of working in London on a huge variety of TV shows, indies and TVC’s Andy made the decision to travel to Australia. After getting off the plane Andy jumped straight into Australian TV, editing shows such as Deal or No Deal, Rex Hunt Fishing Adventures and Huey’s Cooking Adventures. Since these early times in Australia, Andy has gone from one exciting project to the other whether it’s a panel show with Father Bob, TVC’s for Bakers Delight and the White Pages to short documentaries about bush fires in the NT. 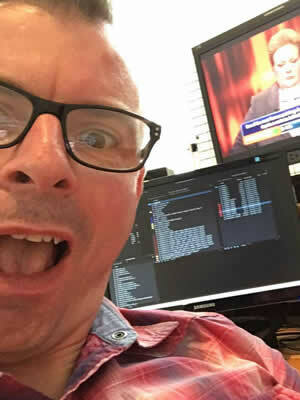 Andy also loves working in a high pressure, stressful environments, working with the team at The Project for many years, he loves the news workspace and the minute by minute updates. Andy is a story teller at heart and loves the challenge of turning anything, be it a promo or a documentary, into a piece that ebbs and flows. He still gets a massive kick out of taking hours of footage and turning it into something that people watch and enjoy.